About 20 eBooks of the publisher Institute of Physics from the years 2013 and 2014 are now available within TUHH intranet. 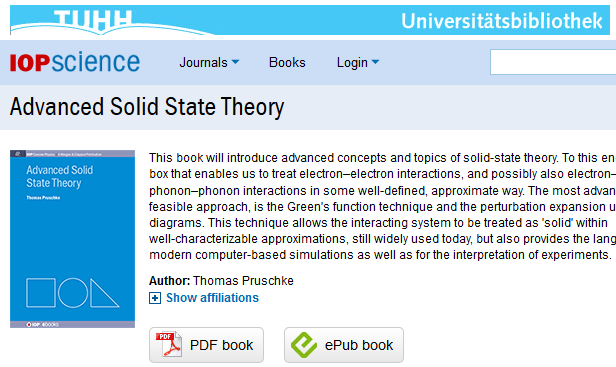 Advanced solid state theory / Thomas Pruschke. Physics of the atmosphere / Rodrigo Caballero. The tao of microelectronics / Yumin Zhang. Quantum chemistry : a concise introduction … / Ajid J. Thakkar. Principles and applications of fourier optics / Robert K. Tyson. Defining and measuring nature : the make of all things / Jeffrey H. Williams. Especially, IOP eBooks are not only offered as pdf file, but also in the open standard for eBooks ePub. So you can read them better on your tablet, eBook reader or – if need be – on your smartphone. This entry was posted in Digital World, Learning, Search and find, Subject Information by Thomas Hapke. Bookmark the permalink.